When selecting a commercial bike locker, the security it provides is the most important factor. So important we have an entire video that reviews the security elements of bike lockers. But there are a variety of other considerations – like performance, design, aesthetics, configuration and installation - when selecting the best bike locker. And we review these in the below video. The first point we’re going to look at is performance. For maximum performance of steel bike lockers, the finish of the steel is most important. With the right make up of steel components, you can expect the lockers to remain sturdy and secure for many years. Whether they’re placed in controlled environments our outside exposed to weather. Locking mechanisms, handles and other components should be a stainless steel. As these are the working parts of the bike locker, the higher quality of steel will keep these functioning for years. Turning our attention to design and aesthetics, a bike locker will need to accept most standard-sized bicycles. Generally, the measurements of a bike locker should be more than the standard bicycle measurements: 72 inches long x 24 inches wide x 46 inches tall. With horizontal bike lockers, the unit is one layer on the ground where the door can be opened, and the bicycle can be rolled directly into the locker. The storage capacity of each unit is what needs to be considered next. These lockers are a few inches taller than horizontal bike lockers are long. The extra space is needed so the bicycle can be lifted onto a hook that holds the bicycle in the vertical position. This type of locker also requires the cyclist to lift the bicycle for storage, which may limit the use by some cyclists. For site considerations with bike lockers, there are multiple things to be aware of and gotchas to be on the lookout for. Like placed too close together or too close to other objects that can limit how far a door can open. Two-sided lockers need to be accessible from both sides. As it relates to configuring bike lockers, because lockers are generally modular in shape, they are designed for in-line or banked configurations. For installation, many steel bike lockers arrive disassembled to save on shipping costs. They will need to be assembled and then placed in the desired location. 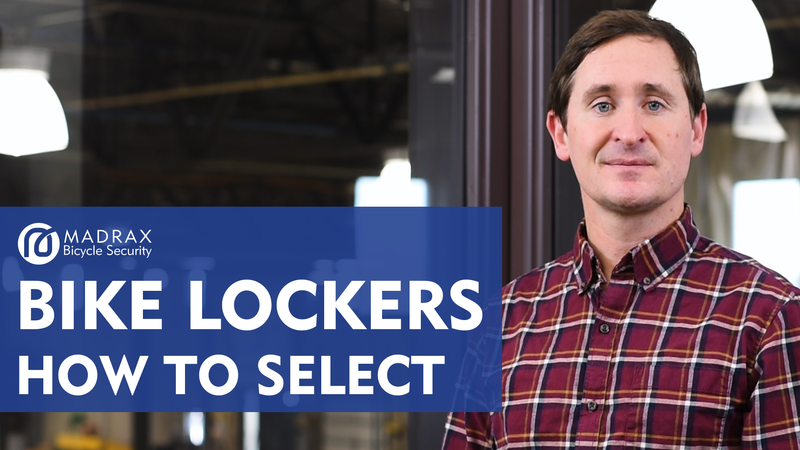 There are a variety of considerations when evaluating bike lockers. The information in this video should help guide you to selecting the correct one for your application. What else would you like to know about bike lockers? Let us know in the comments below. Or tell us a topic we should cover for a future video.